President’s Report 2015 – activities & contributions of DNS members, presented at AGM on November 3, 2015 by Tom Bearss. President’s Report 2013 – activities & contributions of DNS members, presented at AGM on June 10, 2013 by Tom Bearss. Club interests: Botany, wildlife, conservation and birding. 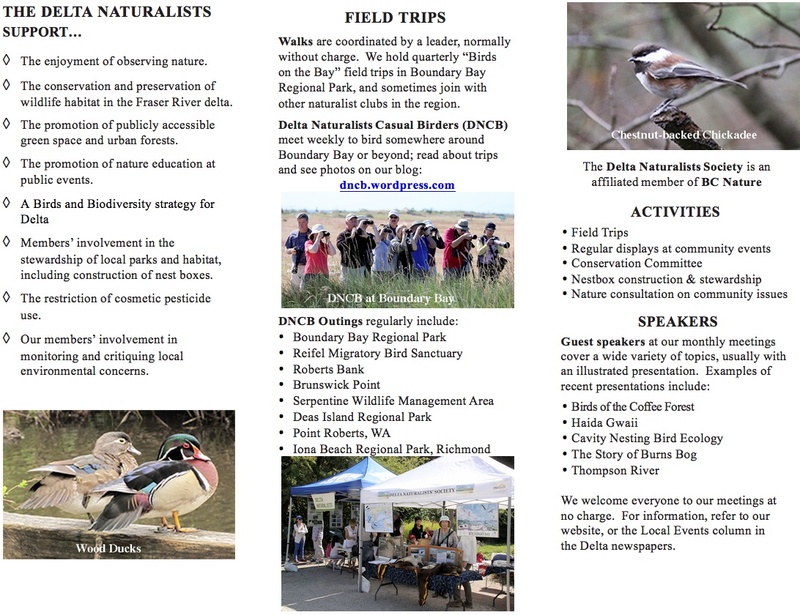 When it meets: DNS monthly meetings held on the first Tuesday of each month (except July and August) at 7:30 p.m. For DNCB birding outings check the Delta Nats Casual Birding blog. Other: Situated on beautiful Boundary Bay and close to many natural birding areas such as the Reifel Migratory Bird Sanctuary and two regional parks (Boundary Bay and Deas Island). Delta Nats Brochure (PDF document) can be downloaded HERE. DNS Membership form (MS Word document) can be downloaded HERE. DNS Waiver Form (PDF version) can be downloaded HERE. Is it possible to get hard copies of your “Birds in Delta” brochures for my adult immigrant ESL (LINC) class. I would like to do a birding fields trip with the class and your brochure would be an excellent resource. Is there anywhere I could pick some up? Joann, I’m sure you can pick up a bunch of pre-printed “Birds in Delta” brochures. I’ll contact brochure co-author Terry Carr who will be able to help you.